The Sault Ste. Marie Drinking Water System (SSM DWS) serves a population of approximately 74,000 (within the Urban Service Line area) of the City of Sault Ste. Marie and Rankin Indian Reserve. Typical annual water pumpage is in the order of 13.5 million cubic meters per year and maximum peak day is in the range of 65,000 cubic meters. Water for the greater Sault Ste. Marie area is presently obtained from two independent sources. One source of supply is from six deep wells in 4 pumping stations located at the Steelton Pump Station, Goulais Pump Station, Shannon Pump Station and Lorna Pump Station. The well at Steelton is 25 meters deep, Goulais wells are 55 meters deep, Shannon well is 102 meters deep and Lorna wells are 53 meters deep. The water pumped from the wells is disinfected and pumped directly to the distribution system. All four pump stations utilize chlorine for primary and secondary disinfection. Water from groundwater sources are provided by 6 deep wells at 4 different locations. Two of the well sites are located in the West areas of the city, while the other two are in the eastern part of the city. Water quality and quantity within the aquifer are both excellent with very little fluctuation of both throughout the year. The second source is from Lake Superior at Gros Cap. The intake structure, located in 15 meters of water is connected to the Raw Water Pumping Station by 830 meters of 1200mm diameter polyethylene pipe. The raw water from Lake Superior is pumped to the twin control tanks on Marshall Drive and then flows by gravity through a 750mm diameter concrete watermain to the Water Treatment Plant (filtration plant). The difference in elevation between the pumping station at Gros Cap and the control tanks at Marshall Drive is 40 meters, while the difference in elevation between the control tanks and the treatment plant inlet is 20 meters. The filtration plant is of the direct filtration type incorporating chemically assisted coagulation, flocculation and dual media filtration but with no sedimentation. The plant is located on the south side of Second Line between Town Line Road and Carpin Beach Road immediately east of the Little Carp River. The plant is rated at 40,000 m3 per day but is capable of operating at higher levels for extended periods at times of high demand, subject to contact time limitations. The complete water supply system, including the Gros Cap Pumping Station, deep wells and filtration plant, are monitored and controlled through a SCADA system from the Control Room at the Water Treatment Plant. There is a central process controller and data logging facility along with a graphic panel indicating the plant and the distribution system components. The surface water treatment plant is rated at 40,000 cubic meters/day, using chemically assisted filtration and chlorination for treatment and primary disinfection. Secondary disinfection is achieved through chlorination. The plant has the ability to introduce ammonia into the treated water line as the water leaves the plant for chloramination, however the process has been discontinued since October, 2011. The distribution system is divided into two pressure zones (Pressure Zone Map); one below the escarpment and the second above. A 27,275 m3 reservoir located on Second Line west of Highway 17 North provides balancing storage for the pressure zone (Zone 1) below the escarpment. Pressure for Zone 2, above the escarpment, is provided by a 9,000 m3 reservoir located on Peoples Road at Coronation Drive. There are four identified booster pumping stations which provide water pressure for their respective areas. These include the Zone II Booster, Coronation St. Booster, Crimson Ridge Booster, and the People's Road Booster. Sizes of mains vary from 900 mm diameter down to 50 mm diameter to provide a total length of approximately 470 km of distribution mains. Approximate breakdown of major pipe materials includes 51% cast iron, 26% ductile iron, 14 % PVC and 9% concrete pressure pipe. 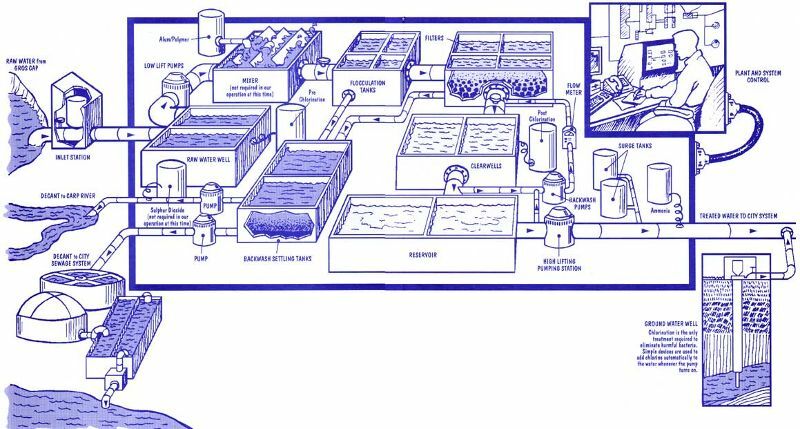 The Water Filtration Plant is of the Direct filtration type incorporating chemically assisted coagulation, flocculation and dual media filtration but with no sedimentation. The plant is rated at 40,000 m3/day. The plant receives raw water by gravity from the Marshall Drive Control Tanks located at the height of land between Gros Cap and the plant site. The plant is located on the south side of Second Line between Town Line Road and Carpin Beach Road immediately east of the Little Carp River. The water enters the plant through a powered isolating value and then through two flow regulating valves in series and into a raw water well. The first valve reduces the pressure and the second valve controls the flow. Pre-chlorination is carried out as the water enters the well. Four raw water pumps lift the water from the well to flocculation tanks. Each pump discharges through valves and a chemical rapid mixer. Aluminum Sulphate can be added at the rapid mixer. Each pump is started from the Control Room. There are four flocculation tanks with variable speed mixers. In these tanks the water is stirred in order to promote the growth of small strong 'pin point' floc particles almost too small to see. These are ideal for removal of impurities in the filter. The water passes on to the filter. The Filters contain hard anthracite coal over sand. The deep layers of coal retains the floc particles produced in the flocculation tanks. The clear water is pumped up under the filters and piped through four regulating valves and meters to dual clear wells. The filtered water is post chlorinated as it enters the clear wells. Each has an outlet to maintain the retention time for chlorination. The water passes from the clear wells to reservoir. The water passes through the reservoirs to promote circulation. The high lift pumps are located between the filters and the treated water reservoir. The initial high lift pumps discharge through a transmission main to join the existing distribution system at Second Line and Allen's Side Road. Ammonia is added at the plant discharge main for chlorine residual control and compatibility with existing well water. Space is also provided for future pumping units which will supply the north west part of the City when development and demand increases. Filter washing will normally take place at 72 hour intervals. Waste backwash water from filter washing is directed to two holding tanks. After settling, the clear decant water is discharged to the plant overflow pipeline which also carries site drainage down to the Little Carp River. The solids settled in the backwash water tanks are pumped through a pressure main to the City sewer system for handling at the West End Water Pollution Control Plant. The Complete new water supply system, including the Gros Cap Pumping Station and existing PUC facilities are all monitored and controlled from the Control Room at the Water Treatment Plant together with the Plant itself. Bulk water stations are specifically designed to minimize the potential for contamination of the water supply system, and reduce discoloured water events. Unauthorized withdrawal of water through a fire hydrant is considered illegal. Pine St. Extension (east side) between Northern Ave. East and Second Line E.
John St. (west side) between Conmee Ave. and Elm St.
A permit is required to access these Bulk Water Stations which is available through Customer Care at 500 Second Line E.
PUC Services annually (mid-April to mid-October) perform operational testing of the city’s approximately 2300 hydrants. This work is necessary in order to ensure all hydrants are functioning properly. The work involves a complete physical check of each hydrant as well as the discharge of water. This activity may change water flow patterns in the distribution system which may stir up existing deposits of scale and sediment within the pipes, resulting in discoloured water. Consumers need not be alarmed. The water is and will remain safe for consumption at all times. Anyone that does draw discoloured water is requested to flush their cold water faucet (preferably from a laundry or bath tub without screen or filter) for 5 to 10 minutes or until it runs clear before calling PUC Services. Do not run the hot water, in order to avoid filling your hot water tank with discoloured water. If the water does not clear up after at least 15 minutes of flushing, please call PUC Customer Care at 705-759-6522 Monday through Friday from 9:00 to 16:30 and 705-759-6555 at all other times. There will be no hydrant testing on weekends or holidays. PUC Services experiences on average approximately 90 watermain breaks a year (5 year average) mostly involving the older cast iron watermains. Most watermain breaks will be most obvious, due to the amount of water surfacing to the ground. Others will remain below the surface and hard to detect. For this reason, PUC Services conducts a Leak Detection Survey every year on the distribution system to locate non-surfacing leaks on the system. This will reduce the amount of “unaccounted for water” and eventually save on operating costs. In order to meet its infrastructure renewal objectives, PUC Services, in conjunction with the City of Sault Ste. Marie’s road reconstruction projects, will replace our ageing watermain infrastructure.